Over the weekend, the 61st Grammy Awards took place in Los Angeles. Hosted by Alicia Keys, the 15-time Grammy winner had a few tricks up her sleeve. 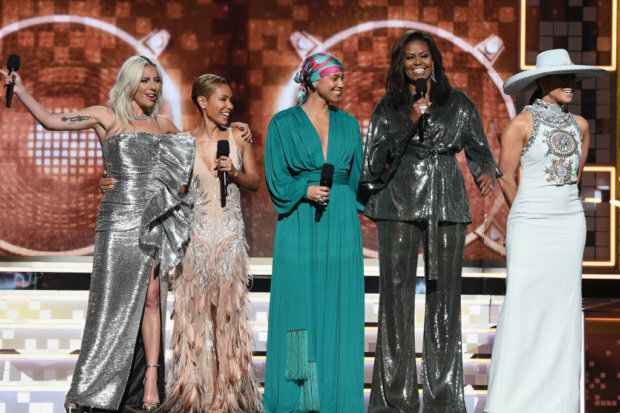 Rather than giving a joke-fueled opening monologue, Keys decided to share the spotlight with four of her friends, who all happen to be some of the most iconic ladies on the planet. Then, behind Keys, walks Lady Gaga, Jada Pinkett Smith, Jennifer Lopez — and Michelle Obama. Each of the icons spoke open and honestly about how music has played a significant role throughout their lives. But when Obama was handed the mic, everyone basically lost their minds. Before she could even finish her first sentence, the audience erupted in applause, with audience members cheering wildly and some even shedding a tear or two. It was clear that the audience members weren’t the only ones in awe of Obama. Keys, Gaga, Pinkett Smith, and Lopez were also noticeably starstruck by Obama’s words and concluded the opening monologue by linking arms with one another.